Don't let our name fool you – we have furniture for every room in your home. Are you are a “choosy mom” who has an even choosier child who thinks Sushi is Yucki? Jif has a three ingredient, three step, and three minute recipe she will find yummi. This week’s Recipe For Fun is brought to you by, you guessed it – Jif. We had so much fun making our own kid pleasing Sushi. Who likes crusts anyway? The chopsticks though, they will take a while to master. Hope that you enjoy this recipe as much as we did. ROLL each slice into a tight spiral. Cut each spiral into 4 pieces. Give this a try and please share with us your opinion. So, okay then, you still think Sushi is Yucki?. Ready to have some cook together fun with your family this weekend? Try these classic Turkey Handprint Cookies, this week’s recipe for fun. Gather up the small hands at your house. Your little ones will surely get a kick out of watching their handprints turn into edible turkeys. 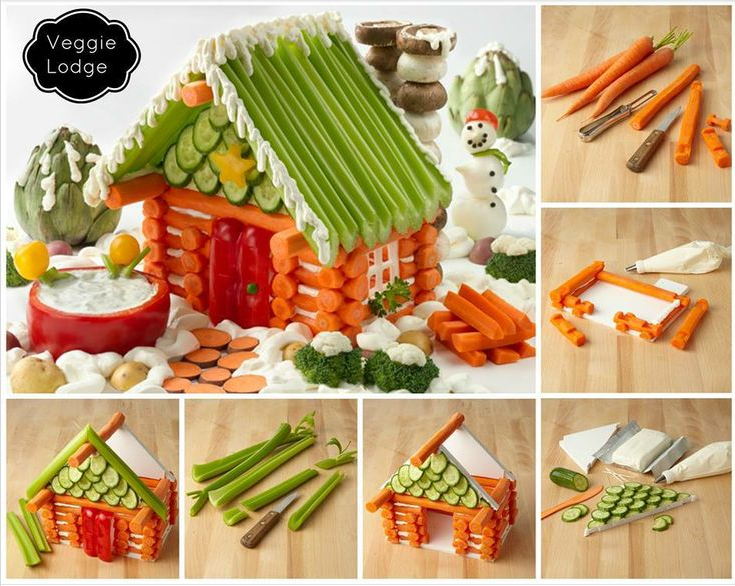 This is a fun group activity allowing kids to not only make their own creations, but eat them too! Family Corner has the recipe, so go ahead and gobble up a few cookies. Kids love the pretend kitchens at Totally Kids fun furniture & toys. It’s Earth Day today, so why not go eat some ooey gooey Earthworms to celebrate? Family Bites has the dirt on this dish that you know will be a hit with your family. After washing and drying your flower pot well, fill to the top with the ice cream of your choice. 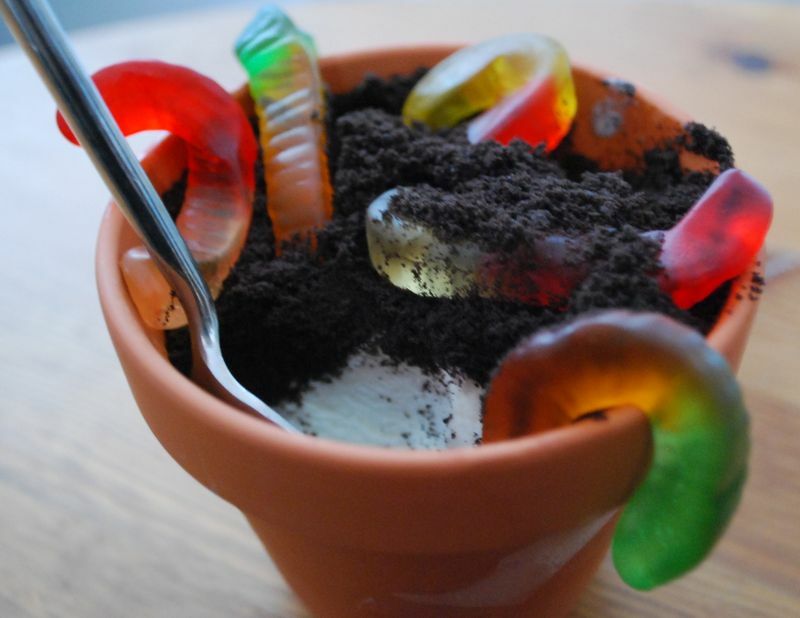 Cover the ice cream with Oreo cookies crumbs and stuff with ooey gooey gummy worms. We hope that you will enjoy constructing our traditional Earth Day treat with your kiddos and add it as a recipe for fun at your house. Happy World Smile Day 2015! Friday, October 2nd will be World Smile Day so get your pearly whites ready and start practicing. Harvey Ball of Worcester, Massachusetts, who, in 1963, designed the original smiley face logo is credited with creating this special day set aside for happy smiles everywhere. He thought that we all should devote one day each year to smiles and kind acts throughout the world, regardless of politics, geography and religion. World Smile Day® is the first Friday in October each year, people all around the planet perform acts of kindness and help others smile. Here is a healthy treat from family go that’s sure to put a “smile” on anyone’s face. Even the youngest kiddos can help create these; an excellent cook together. This week’s Recipe for Fun: False Teeth aka Apple Smiles. Spread peanut butter on one side of each apple slice (squeeze a little lemon juice over the apple if not serving immediately). Place four miniature marshmallows on one apple slice and then lay another apple slice, peanut butter side down, on top. Let’s celebrate National Dog Day today with these simple and is a fun cook togethers. For a tasty dog in a dog, you simply bake a hot dog inside a dog shaped portion of dough. If you’re kinda feeling the Dog Days of Summer, give this a try. Watch the instructions on video that walks you through the recipe. And…please do not forget your pooch. Kids will have a grand time preparing these biscuits for their favorite dogs. Gather round and watch this how to do it video put on by kids having fun at Highlights. Woof, woof! Higgins, the Totally Kids Shop Dog approved. Have a happy Father’s Day at your house. Imagine the surprise on your father’s face when he is served these special Pancake Pops on Father’s Day morning. This week’s Recipe for Fun looks like a true win win for pancake lov’n Dad and the kids. Melissa from Number-2 Pencil blog, will show you in a colorful pictorial how to make these bite size pancakes from scratch using creamy Greek yogurt, cooked on a lollipop stick. We know these Pancake Pops for Pops will be a favorite at your house, and not reserved just for Father’s Day breakfast. Move over gingerbread, look what’s moving into our neighborhood. Bring back your old Lincoln Log skills and you can easily build one too. The window is made out of a slice of turnip. Toothpicks are recommenced, in addition to cream cheese mortar to fasten cucumbers and celery. Bamboo skewers will be handy for stacking the chimney (mushroom) stones. Photo credit and inspiration: Green Giant. If you are one of the guilty ones, here’s looking at you! 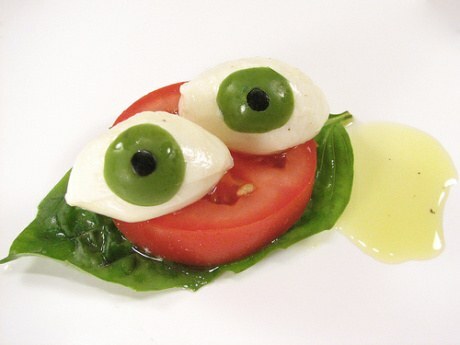 Go right ahead and enjoy this vegetarian recipe for Eyeball Caprese. 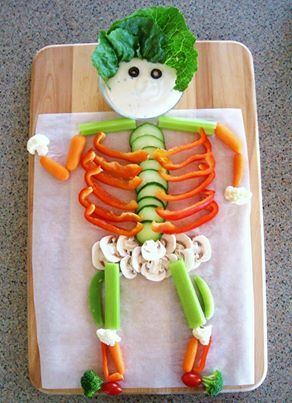 Scare up some veggies and concoct a skeleton to enjoy on World Vegetarian Day 2013. 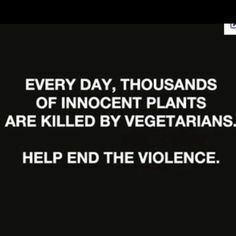 You can make a difference by participating tomorrow, October 1st, in World Vegetarian Day 2013. If you take the time you can learn the health benefits of a vegetarian diet, as well as how it can save the lives of animals and help to preserve the Earth. Boo! It’s not all about veggies. This week’s Recipe for Fun features a dog in a dog. The idea is simple and is a fun cook together with young children. You simply bake a hot dog inside a dog shaped portion of dough. If you’re kinda feeling the Dog Days of Summer, give this a try. Watch the instructions on video that walks you through the recipe.